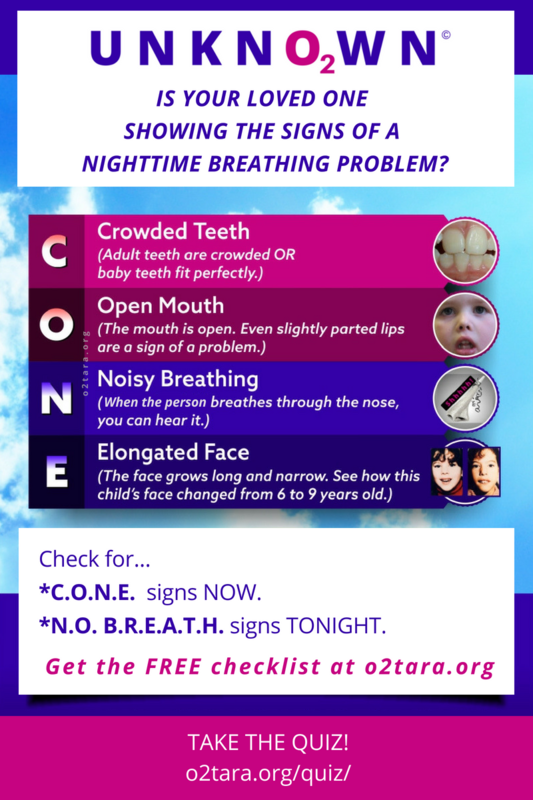 IS YOUR LOVED ONE SHOWING THE SIGNS OF A NIGHTTIME BREATHING PROBLEM? If your loved one is struggling to breathe at night, he would tell you, right? Yes–-if he could. But he can’t tell you if he doesn’t know. But he is showing signs. Why are so many people not getting the help they need? Because many people simply do not know the easy-to-spot signs. And the unfortunate fact is that many doctors and many pediatricians don’t know the signs, either. YOUR LOVED ONE WILL NOT HAVE THE LIFE HE SHOULD IF BREATHING DURING SLEEP IS A PROBLEM. The good news is that people with nighttime breathing problems are showing us easy-to-spot signs…all day and all night. And if we can SPOT it, we can STOP it! What is the number one sign of a nighttime breathing problem? It’s simple: an OPEN MOUTH. you CAN help him at home! Get strategies here. WHY IS AN ELONGATED FACE A PROBLEM? But that elongation is just what we can see from the outside. If we could look inside, we would see that as the jaw grows longer, it makes the airway smaller. And smaller. The smaller your airway gets, the closer you are to developing nighttime breathing problems like snoring, UARS, and sleep apnea. All of these mean you have a disrupted flow of o2 to your brain. And you have disrupted sleep. This is a combination that is deadly to brain cells and leads to physical and mental health problems. SECOND…Check your loved one for the signs when he is ASLEEP. can help you change your loved one’s life. If you see any of these signs when your loved one is AWAKE, check for other signs when your loved one is ASLEEP. Did you know 11% of all children in the industrialized world are affected by nighttime breathing problems? Did you know at least 26% of adults are affected?? (Current professional estimates suggest 50% of males and 25% of females are affected.) Check for the signs NOW. Get the checklist here. Disclaimer: This information is not offered as medical advice and should not be construed as such. Consult a qualified sleep professional for information on diagnosing and treating sleep-related breathing problems in children and adults.